To enable Windows 10 to create backup copies of your files, first make sure that an external drive such as a hard drive or flash drive is connected to your computer. Then select the Start button and choose Settings on the Start menu. In the Settings window, select Update & Security. Then select Backup in the Update & Security window. A Back Up Using File History screen opens, as shown. Which screen you see depends on whether you have told Windows 10 where you want to keep backup copies of your files. Another way to access the Back Up Using File History screen is to select Configure This Drive for Backup when you attach an external hard drive. File History stores information on an external drive or a network location. After you turn on File History, it will automatically create copies of your documents and photos on the drive you identify. 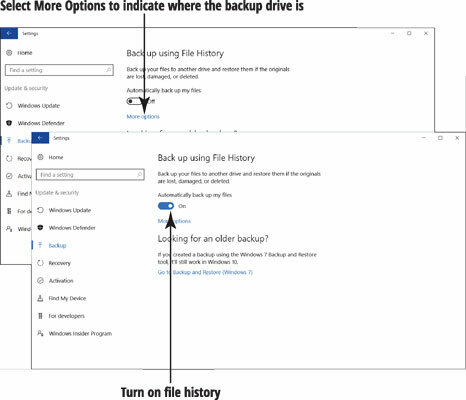 If you lose, delete, or change your mind about changes to a file, you can restore the backup copy created by File History. If necessary, tell Windows 10 where to keep backup copies of your files. 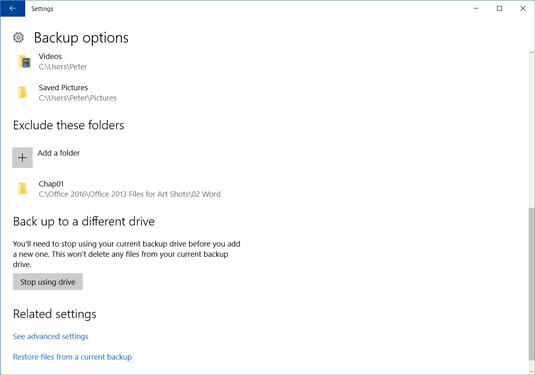 (If your screen looks like the bottom of the image, Windows 10 already recognizes where your backup drive is located; skip to the next step.) Select the More Options link, and in the Backup Options window, select See Advanced Settings (you’ll find it at the bottom of the screen). The File History window opens. It lists the external drives connected to your computer. Select the Turn On button. Then close the Settings app and repeat steps to return to the Back Up Using File History screen. Turn on the Automatically Back Up My Files setting if this setting isn’t already turned on. Windows 10 starts copying files to your hard drive. Back Up My Files: This option controls how frequently File History checks for new or changed files. Select Every 10 Minutes to minimize the chances of losing new or changed documents. When you go on vacation, consider disconnecting the external drive and storing it in a fireproof safe or a safe deposit box. The drive is your insurance against theft or destruction. Keep My Backups: By default, File History keeps copies of your files forever. This option allows you to limit how long copies are kept. Leave this set as Forever. Back Up These Folders: File History provides a laundry list of folders to back up. To remove a folder, select it in the list. The Remove button appears. Select this button. Folders you remove are added to the Exclude These Folders list at the bottom of the Backup Options screen. To add a folder, select the Add a Folder button. Then select the folder in the Select Folder dialog box. Back Up to a Different Drive: Select the Stop Using Drive button and repeat Steps 1 through 3 to choose a different external drive for keeping backup copies of your files.